What Are Cataracts in Cats? Can cats get cataracts? Yes, they can. Fortunately cataracts in cats are rare, but they can still happen to any cat. Feline cataracts occur when the lens of the eye becomes clouded. After cataracts your cat may partially or even completely lose his vision. How does it happen? When cats have no problems with vision their brain is interpreting the patterns of light which reach the retina. A cataract blocks the light coming through the lens, so the retina receives less information for the brain to construct a picture out of. Why Do Cataracts in Cats Occur? As we said above, cataracts in cat are rare, but still they can occur to any cat and there are some reasons, which increase the risk of cataracts. Failing eyesight with old age is common not only for cats, but for many other species. The fact is cataracts are more common in older cats. All cat breeds can have this disease, but some breeds have a higher hereditary risk of developing cataracts. 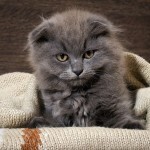 Among them there are Persian cats, Himalayans, and Birmans. These breeds have a higher chance of getting cataracts. 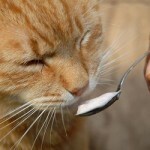 Even though health conditions also may contribute to cataracts in cats, for example dehydration or diabetes. And inherited cataracts are inevitable, you can prevent cataracts brought on by health problems. These are some of the causes of cataracts which can be managed, either by prevention, or quick action when you spot them. Uveitis, or inflammation of the eye, is among the most common problem with vision for cats. It can cause not only cataracts but also eye pain or even blindness. Symptoms of uveitis are the same as that of pink eye in humans: redness, discharge, squinting, excessive tears, and a cloudy or dull eye. If you notice that your cat has some of these symptoms, then you should immediately take him to the vet. Almost as in humans, cats may suffer from diabetes mellitus. During this disease, the organism can’t generate the amount of insulin needed to regulate the glucose levels in body. This is the serious health issue may cause not only cataracts, but also weight loss, appetite loss, digestive discomfort or even death. If you suspect your cat may have diabetes mellitus you should take him to a veterinarian as soon as possible. We all know that cats are very curious creatures. And sometimes their curiosity may have bad results. They are small enough to get into secure areas and sometimes they can chew wires not realizing the danger coming from it. Electric shock is not always fatal for cats but it still can lead to some serious health issue and cataract is one of them. Sometimes your cat can fight with other cats or even dog and get injured. The trauma after such fight often can be the reason of cataracts in a cat. Actually this is one of the leading causes of cataracts in cats, so it is very important to treat any injuries your cat may have received as a result of trauma. The first thing you should know if you suspect that your feline pet may have cataract is that he does not fell any pain from it. Yes, the cataracts themselves are painless. The main symptoms your cat can have from cataract depend upon on the amount of vision impairment. If there is less than 30% of vision impairment due to cataracts, it is likely your cat will not face any symptoms. It is because cats don’t rely only for their sight, their other senses: hearing and scent are developed much better than in humans and they will easily pick up the slack. and cloudiness in the pupil. If your cat’s cataract is the result of some another disease (such as diabetes mellitus) you might also notice increased thirst, more urination than usual, and weight loss. If you see any from above mentioned symptoms you should immediately take your cat to the veterinarian. You should never ignore the symptoms of cataracts because they may be caused by other serious reasons, and it is necessary to visit a vet for a full diagnosis and treatment. The veterinarian will likely go over your cat’s health history and ask questions that will help to determine when the first symptoms began to appear. He may also recommend an ultrasound or electroretinography test to determine whether your cat is suffering from cataracts and how serious the cataracts are. If the vet thinks that your cat’s cataract is caused by diabetes mellitus or some other diseases he might recommend diagnostic tests for those conditions as well. Cat cataract treatments are difficult thing, but the earlier you begin to treat the cataracts the better the outcome will be. Sometimes, surgery is required to treat feline cataracts, but not always. In some situations surgery is not the best solution. Prompt treatment and a variation of medications (such as eye drops) prescribed by your vet can help to defer or even avoid the onset of total blindness as a result of your cat’s cataracts. 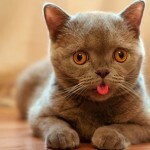 Are Cataracts in Cats Curable? Yes, your cat can totally recover from cataracts but only if he is healthy and a good candidate for surgery. After successful operation from removing cataract your cat will be back to his normal healthy and happy life. Other treatment options, including eye drops and medications, will not remove cataracts completely, but they will make it less severe. Are Cataracts in Cats Contagious? The cataracts themselves are not contagious, but some of the underlying issues that can cause cataracts are contagious. Uveitis can be contagious. 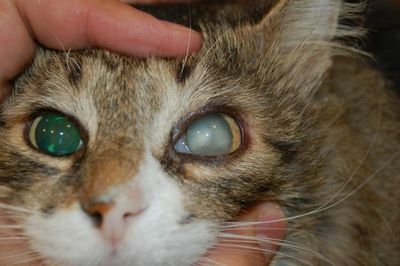 If you have a cat with some of the uveitis symptoms, immediately isolate him from other household cats until you are able to get him to a vet and get a diagnosis. Do you have experience with treating cataracts in cat? Share your story with other cat owners who may be just starting on this journey. David L. Williams, M. Fred Heath, Prevalence of Feline Cataract: Results of A Cross-Sectional Study of 2000 Normal Animals, 50 Cats With Diabetes and One Hundred Cats Following Dehydration Crises, Veterinary Ophthalmology, 2006. Andrea Steinmetz, et al, Lens-Anomalies and Other Ophthalmic Findings in A Group of Closely-Related Angola Lions (Panthera Leo Bleyenberghi), Zoo Biology, 2006. K Narfstrom, Hereditary and Congenital Ocular Disease in the Cat, Journal of Feline Medicine and Surgery, 1999. Salgado D, Reusch C, Spiess B, Diabetic Cataracts: Different Incidence Between Dogs and Cats, Europe PMC, Life-Sciences Literature, 2000. SI Thoresen, E Bjerkas, M Aleksandersen, Diabetes Mellitus and Bilateral Cataracts in A Kitten, Journal of Feline Medicine and Surgery, 2002. Mary Rebecca Telle, DVM, Diane Hendrix, DVM, DACVO, Cataracts in Cats, Clinician’s Brief, 2016.